Wow, I almost missed it. Happy belated Love Our Lurkers Day, everyone. I notice that my browser no longer tags the word "Lurkers" as a misspelling. Now there's a recognition. I would like to add my voice to all of the other spanko bloggers who are celebrating our beloved silent visitors. Thank you for your readership and your support. 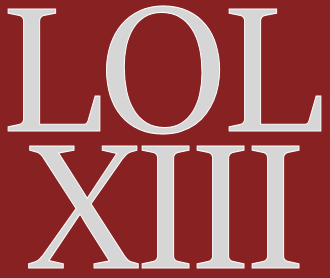 For the full scoop on LOL Day XIII, I invite you to consult our friend and all around resource, Hermione, who keeps this fun tradition alive. Thank u for starting this tradition Bonnie. You were one of the first blogs i read too! I appreciate all that u and Hermione do for the community! Thank you for getting these LOL Days up and going. When I began blogging, I wanted real true friends and I am here to say that is what I have. Good ttwd friends ......... we vacation and visit one another and it is sweet. Thank you, Bonnie for beginning this special thing we bloggers do. Hi Bonnie, I read here from the start! Didn’t even understand how to comment when I began! Thanks for starting LOL days and to Hermione for continuing on. Thanks for starting LOL Day(s) and for being so welcoming to those making the leap from lurker to commentator to blogger over all the years - including myself; thank you! Thank you bonnie for starting LOL day and for Hermione for continuing it. I do love reading here, might not always comment though. Hooray! I'm so glad you joined us,, BOnnie. It wouldn't be the same without you. Hi Bonnie, :) Happy LOL Day!! It is always so nice to see you around. I agree with Hermione, it wouldn't be the same without you! Thanks so much for getting LOL Day rolling back in the day. It is such a great idea, and a special day. I always enjoy meeting new bloggers. I love being able to express my gratitude to them, for reading. It is fun to hear from them. I'm a long time Lurker at your blog I'm afraid but will be sure to start commenting in future. Please feel free to visit my blog glenmoretales.blogspot.com and do the same. Thank you so much for staring this tradition Bonnie. I thank the day you spotted my blog all those year ago. Have met so many lovely friends. Thank you, Bonnie! I am so glad you did not miss LOL. Fondles - I am proud to serve this community. Meredith - That's wonderful! You're most welcome. Windy - It's gratifying to see how our group has grown and flourished. NJ - Thank you. That sense of community is what we always hoped to nurture. Minelle - I treasure our long time readers. Thank you for being a valuable member of our community. Enzo - You are very welcome. Amy - I am pleased that I was able to help way back then. Roz - Happy LOL Day to you as well. Hermione - Thank you. That's very sweet. Katie - Thank you and belated Happy LOL Day! It's always lots of fun. TG - Thank you for visiting! Ronnie - Friends, new and old, are the cornerstone of this tradition. Thank you for your many contributions to our community. Boo - You're most welcome. Thank you for stopping by.